300 Shields Extreme is the second version of the original ultra-high variance classic 300 Shields, Nextgen's most volatile game, even more so than Medusa 2. The theme is the same as before, of Spartan Warriors and the dramatic sounds of warfare as wins appear with the reels set over a peaceful rustic ancient Greek scene. So what's different about 300 Shields Extreme, and will you have to fight like a Trojan to leave here with some of your bankroll? We begin with 5 reels of 3 rows each and 25 fixed pay lines. 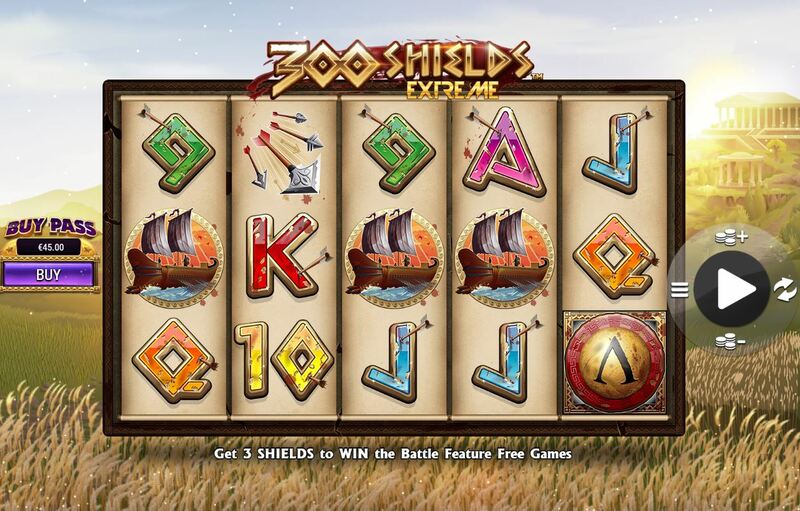 The symbols of 300 Shields Extreme are all single with the Golden Helmet as a Wild paying 40x bet for a 5-of-a-kind hit. After this you get 10x for the Archer or Ship, 8x for the Dagger or Arrows and then six card values paying 6x, 5x and 4x as we descend from Ace down to the 9. There are Shield scatters of all reels hence the name here and all five will pay a nice 100x bet but only three are needed for the main event here, the famous bonus round. So you've landed 3 or more Shields and now you have 5 free games. You'll then see a ladder of 12 Shields on the left of the reels with the bottom one overlaid with x2 (where you begin) the second one up overlaid with x5, the sixth one up overlaid 25x and the twelfth one up overlaid 300x. Any Shields collected will raise you up this ladder, and once you get to or pass those overlays you will get a retrigger of 5 more free games once your present batch of 5 has ended. The overlays are basically a multiplier for any wins containing a Wild within them. 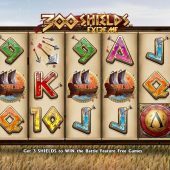 Collect 12 or more Shields and your final 5 spins will play out at 300x multiplier for any Wild wins - this spells 12,000x bet for the top pay of 5OAK Wilds on any spin! You can get 3 Shields in one spin for a retrigger of 5 extra spins for the level/multiplier you are playing under, for example when playing the 25x Wild spins, 3 scatters would add 5 more at 25x. As with the original game the music gets more dramatic in tone the further up the levels you get, reaching a crescendo for the 300x spins, on the rare occasion you see them. Right - this where the Extreme comes into this new version of 300 Shields; features can be purchased for a payment of 60x bet via the Buy Pass button to the left of the grid. Yep! That's the only real difference between this and the Mark 1 Version.